I found this answer in an blog post written by Trace Armstrong: SharePoint 2013 – Branding the Top Bar and the Importance of Browser Testing. You could override this css rule with your colors, just dig into the msdn documentation. What I needed though, was just a plain color, so I didn’t want to dig into that old progid-definitions. There is actually a simpler solution on social.msdn.microsoft.com. A guy called avshinnikov just overrides the “filter” rule by setting it to none. If you apply it only with id selector (#suiteBarLeft) then you have to put “!important” after that. title: "Should even be available when I close the child"
The callee (server [not server application]) is not available and disappeared; all connections are invalid. The call did not execute. Weird. I saw a solution which “serializes” the object before passing to the main window. But for complex object it would be more headache actually. This only runs if placeholders are not supported. This code toggles the class “empty-text”. It’s just a visual hint for not to be confused, otherwise the users can not know which is just a hint and which is the real value. Wouldn’t it be nice to use html5 and css3 in SharePoint? No problems, there is actually v5 master out there, created by Kyle Schaefer. Or just use h5ml5 and css3 right away in your webparts and pages. But there is a big problem. It doesn’t work in IE9–. One of the issues (even listed by Kyle) is that “save” doesn’t work in modal dialogs where Rich Text Editor is used. Especialy it is for modal dialogs. 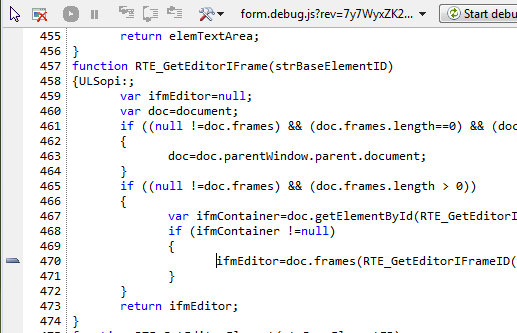 So it is document.frames(“…”), not the usual document.frames[“…”]. What is that VB-style about? Okay, the reason why this error isn’t raised in other browsers is just because this weird code isn’t run (Try to set break point there in Chrome or Firefox). And that’s why you never see Rich Text Editor toolbar in EditForm.aspx in Chrome and Firefox. To prove this, try to remove the Rich Text Column in your list. Then you can use “Save” button again, with IE9 mode! So there it is where the fishy code is invoked. Okay how can we intervene here to enable Save button? All solutions are based on disabling the bad code which is used to “convert” textarea to RichEdit. So to fool Accessibility, just set your own cookie: document.cookie=”WSS_AccessibilityFeature=true;path=/;”. But: don’t do that. It is really bad idea. Many features will stop working. After that you can press Save button. You’ll lose the Rich Text Editor, but you’ll have the nice features from CSS3. DISCLAIMER: It is just an exploration lab. There is no warranty that it will work across the whole site. Don’t ever do such things things at home! If you just want to use css3 in your design and still use team functionality, take a look on pie.htc, jQuery.corner or iecss3. Recently me and my colleague had to fix this issue again in SharePoint 2010. What we found was failing select elements (Choice field or Lookup field) in forms. There are some js functions that do not run in other web browsers rather than in IE in IE9 mode. All fail because of the inability of getting custom html element attributes.